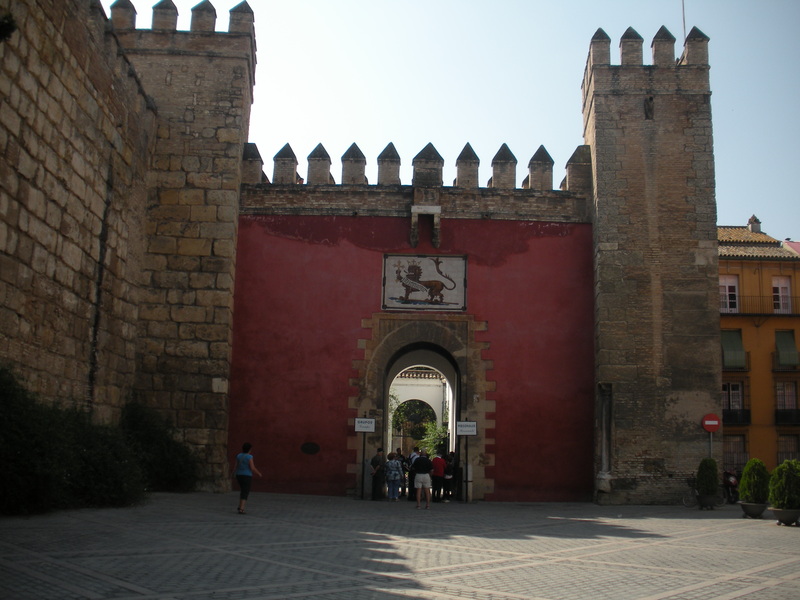 Hubby and I took a day trip to Córdoba while we were in Málaga in March 2011. It was raining so we brought along the umbrellas that we purchased for our May 2010 trip, but never did use that time. This trip we did use them but really, not terribly often. I was glad we had them the morning of our trip to Córdoba as a light rain was falling. 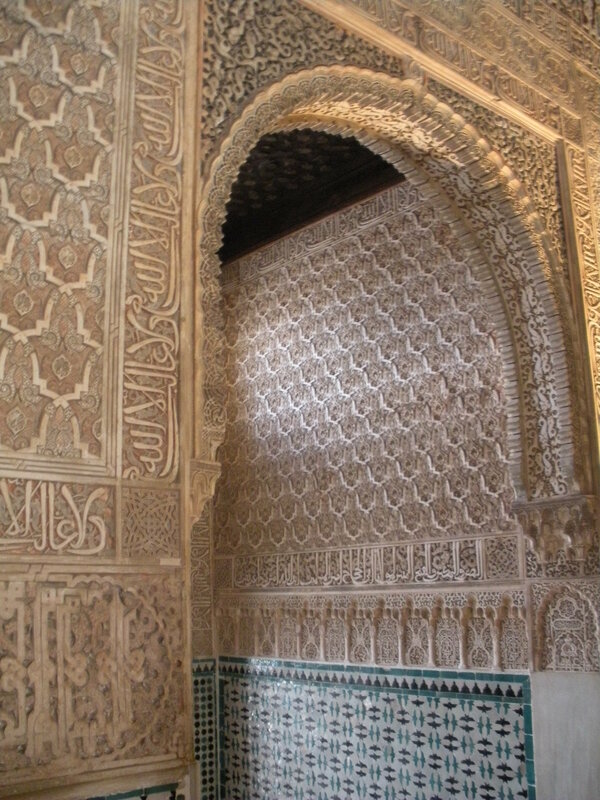 Because of the rain, we took a taxi from the train station to La Mezquita instead of walking and getting wet. 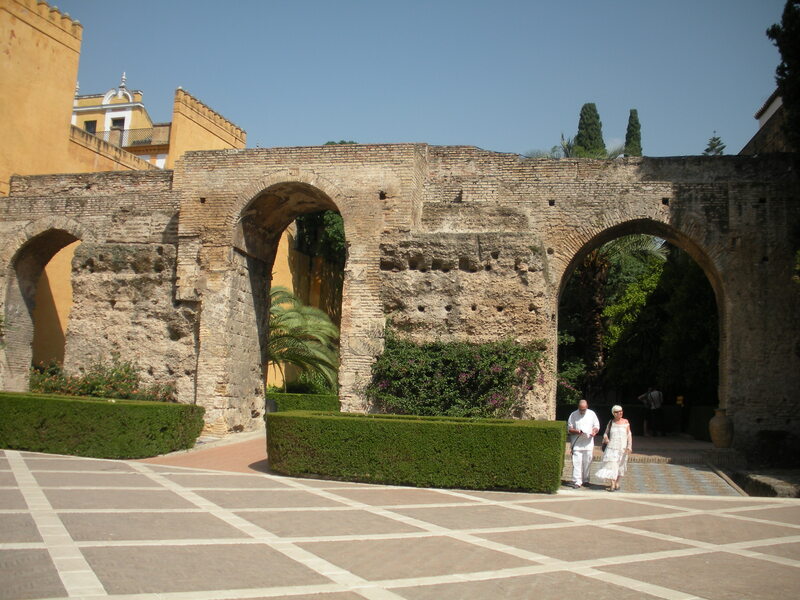 We were dropped off at the gate to the Patio de los Naranjos(below), found the ticket booth and soon we were inside the ancient place(s) of worship. 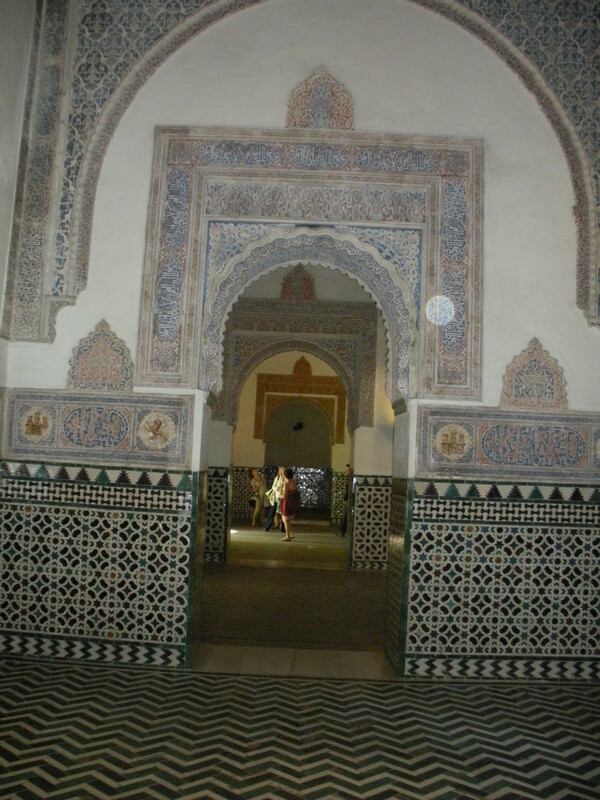 Once you enter the mosque you get a keen sense of how ancient it is. It smells old which is very hard to describe unless you’ve been in an old building. The famous red and white arches seem to go on forever, they are everywhere you look. Beautiful ceilings, always remember to look up!! We walked through the old town, found Plaza de las Tendillas (below) and all the fun shopping streets around the plaza too. We went into a couple of shops but we didn’t buy anything. Afterwards we walked along Paseo de la Victoria and los Jardines de Diego de Rivas, which was very beautiful, on our way back to the train station. What a contrast from the morning. The sun had come out and it was pleasant and now in the 60s. It had turned into a beautiful afternoon. These are the kinds of rainy days that I can deal with, ones that start out with light rain and then clear up for the afternoon. Of course when travelling it’s better if it doesn’t rain at all but we were there at the end of winter after all so good weather isn’t always the norm. We headed back to Málaga, met with friends for drinks and then wandered around Larios street and its environs before heading back to our hotel for our last night in Málaga. Even with the little bit of rain in the morning, it was still a great trip. 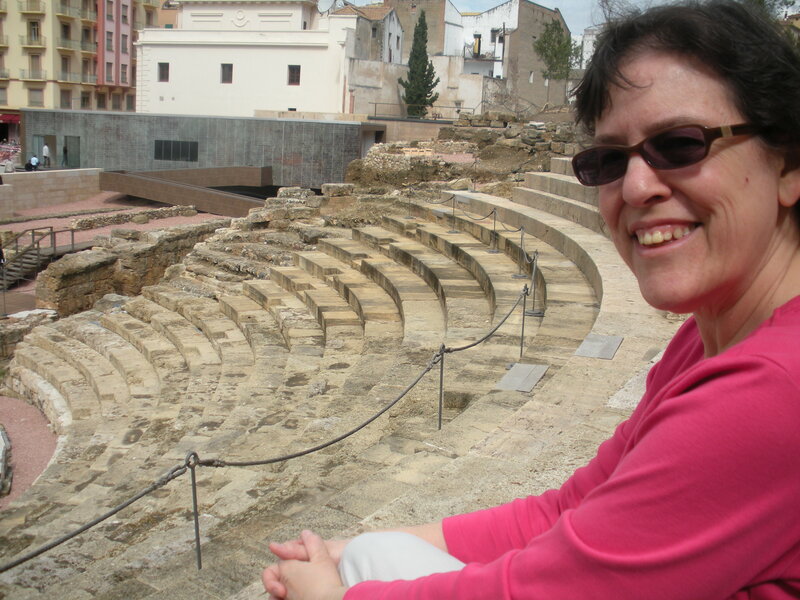 Please help my friend Marianne win the Expat Blog Award won’t you? If you haven’t visited her blog, please do so. 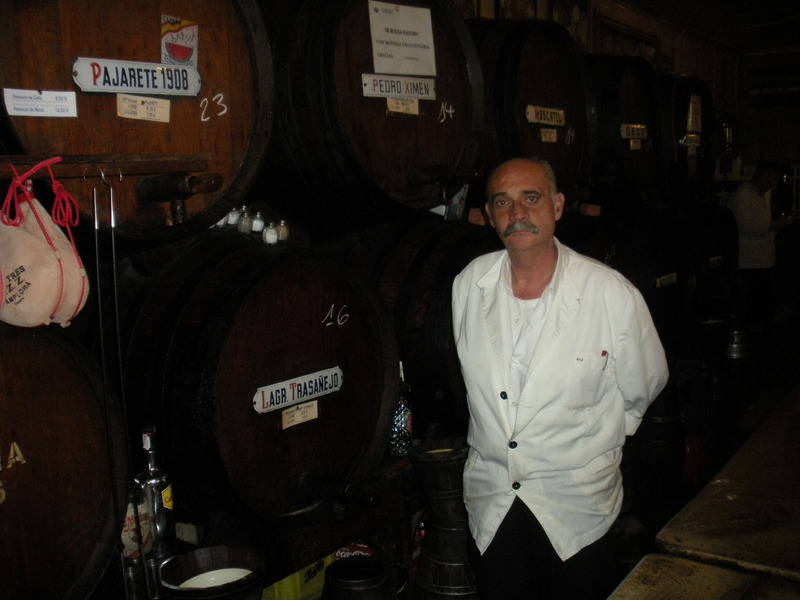 Full of wonderful photos from southern Spain as well as places to eat and places to visit. I just happened upon this cool video about the city I want to retire to. It’s great! Even if he doesn’t pronounce Málaga correctly. 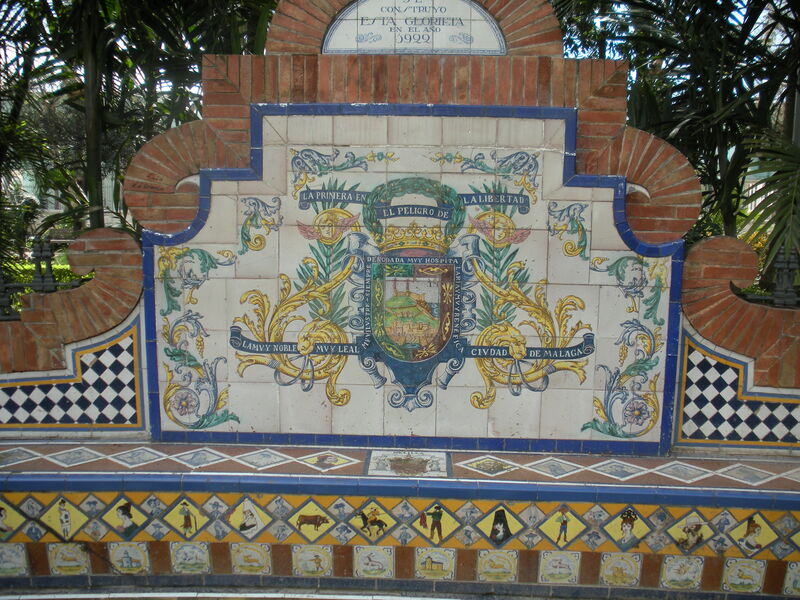 It makes me homesick for Málaga…. 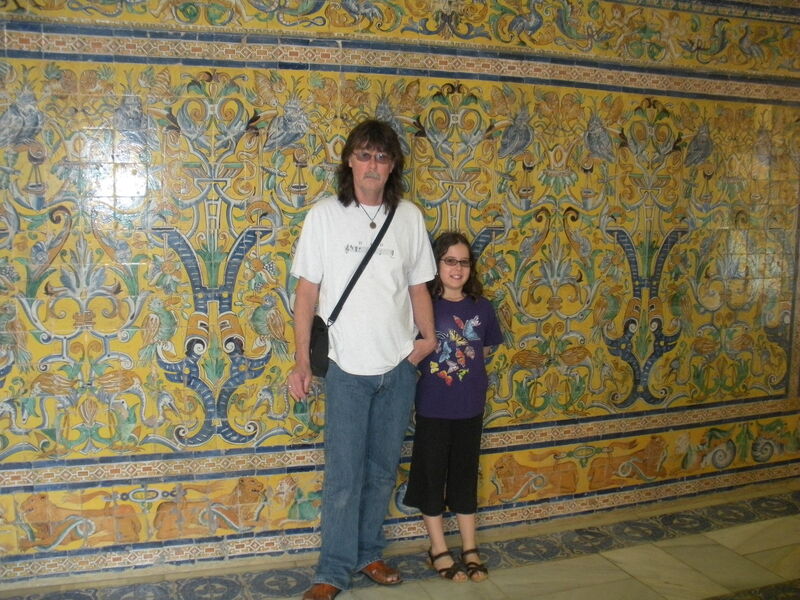 My husband, daughter and I visited Granada for two nights on our two week tour of Spain in May 2010. 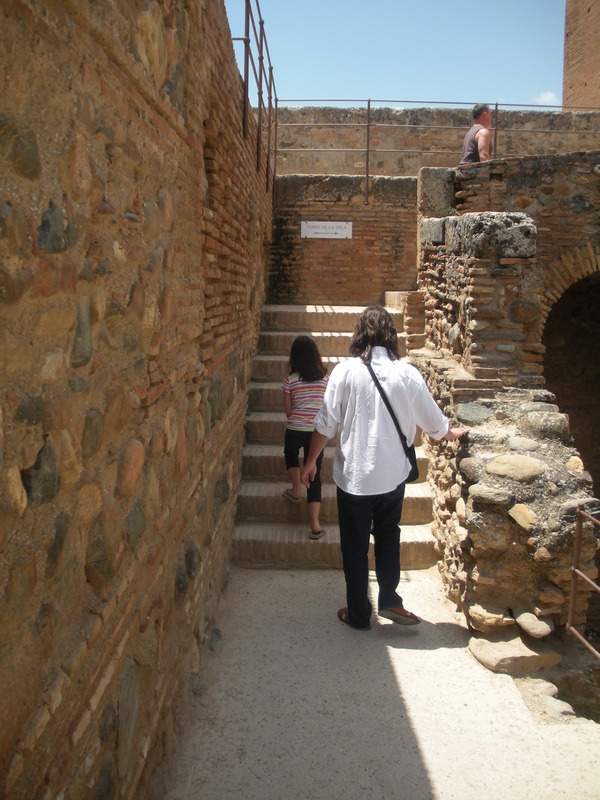 Our day to visit the Alhambra was a very hot day. If I had it to do over again, I would have gotten our Alhambra tickets for the morning instead of the afternoon. We enjoyed it immensely even in the heat. 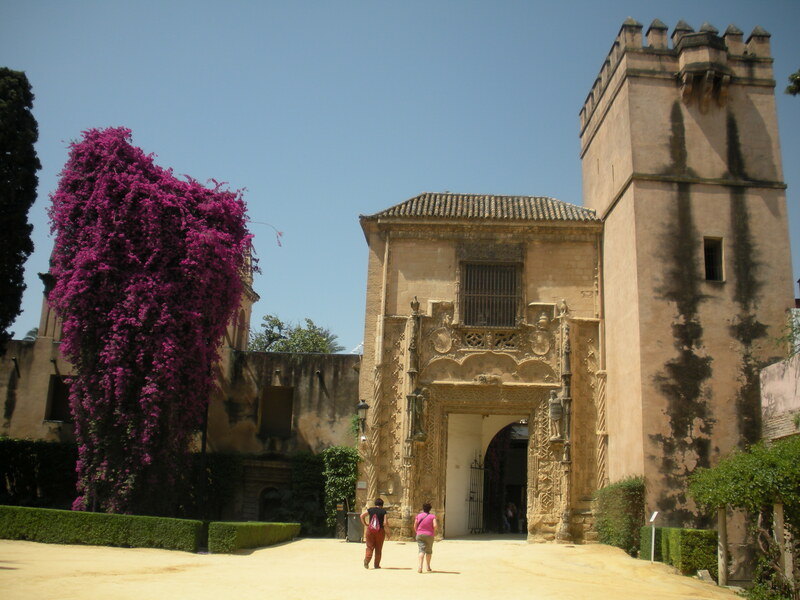 However, because of the heat, we did not make it to the Generalife gardens which I really regret. But as we discovered many times on this trip, you just cannot do everything. 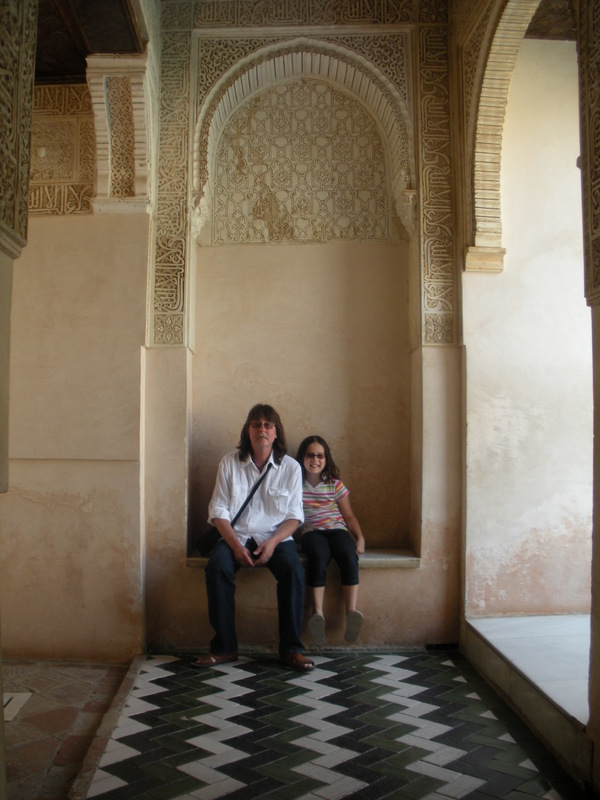 The Alhambra in my opinion is a must for anyone visiting southern Spain. 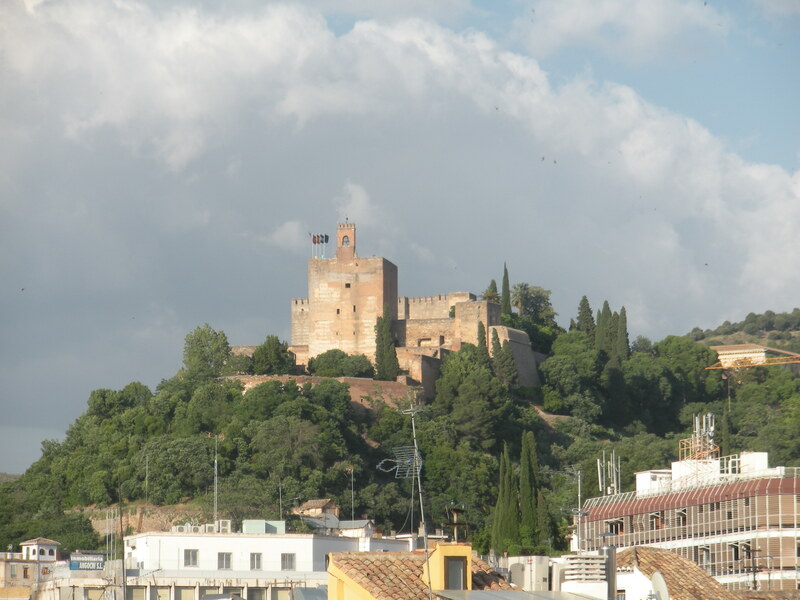 It has a fortress, gardens, palaces and what used to be a city that sits on a hill in Granada, Spain. 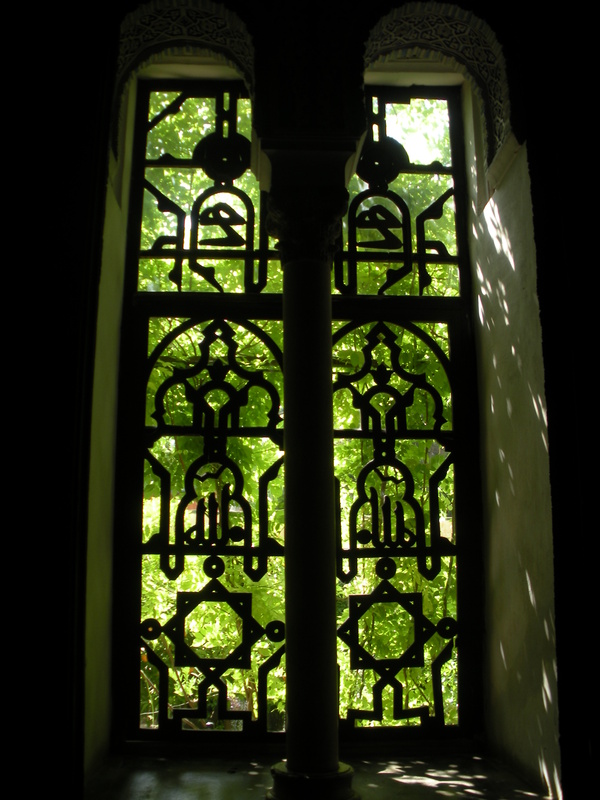 The Moors ruled from there and it contains the most beautiful palace ever, the Nasrid palace. 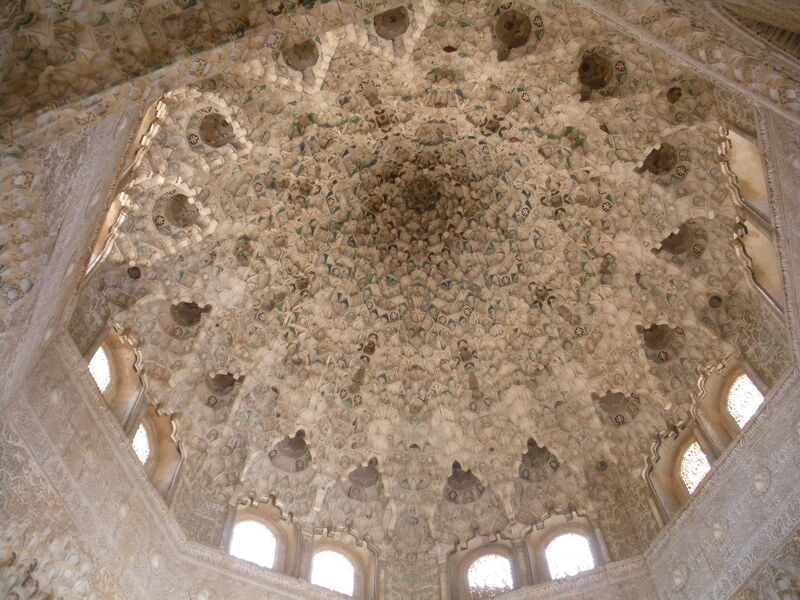 Here are some highlights from our visit to the Alhambra. 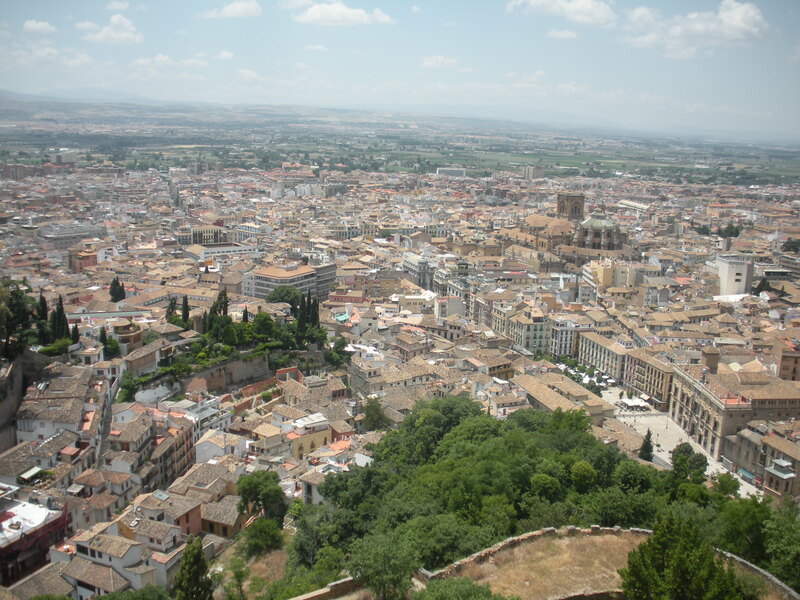 Granada from the Alcazaba - we could see our hotel! okay, this one's a little crooked. but it's still one of my faves. don't forget to look up, there might be something beautiful up there. 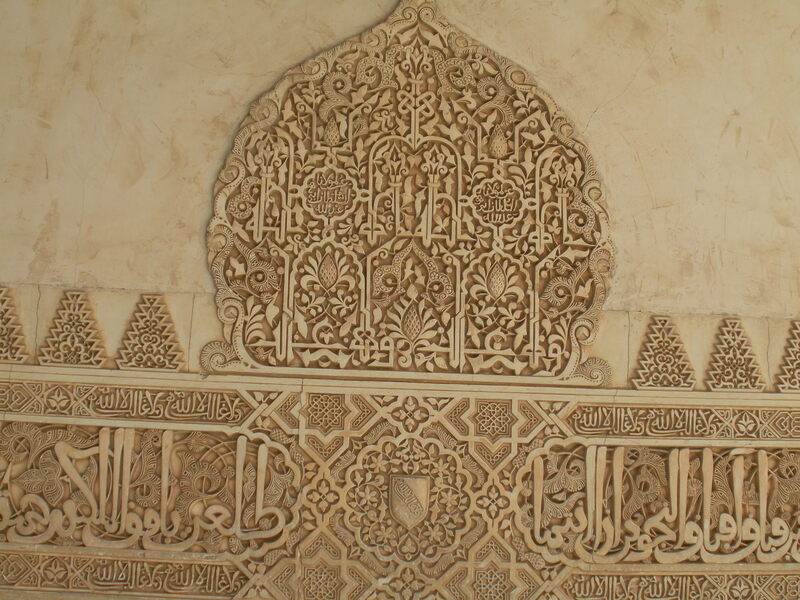 And somewhere at the Alhambra there is an old saying inscribed on tiles(I think) that means “Give him alms woman, for there is nothing in life like the pain of being blind in Granada” (Dale limosna mujer, que no hay en la vida nada como la pena de ser ciego en Granada). I read about this inscription after we returned from our trip but I’m not sure exactly where it is. 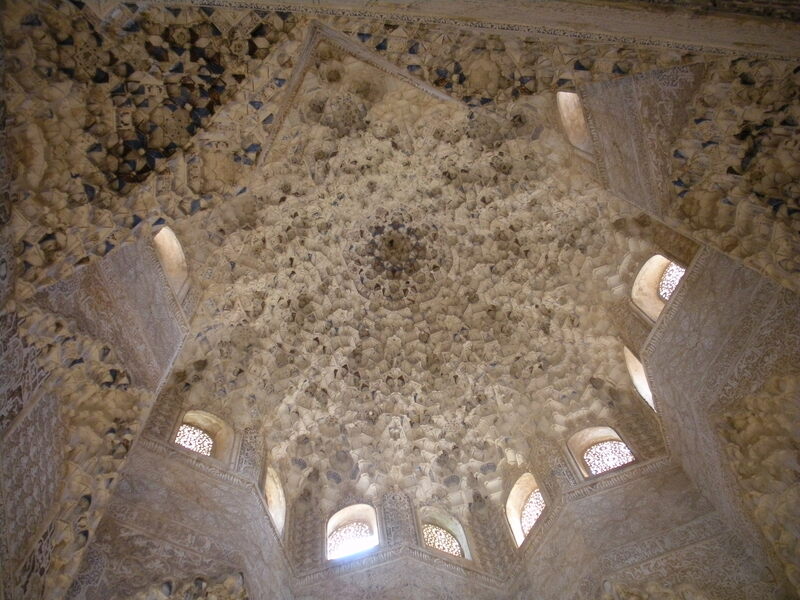 Next time we visit La Alhambra, I want to be sure to see that. Málaga captured both my husband’s and my hearts when we visited for the first time in May 2010 (my post from that trip is here: fun in the sun….). So when we got some surprise money we knew exactly how we wanted to spend it: a trip back to Spain for our 20th anniversary in March 2011. Following are the highlights from our second trip to Málaga. 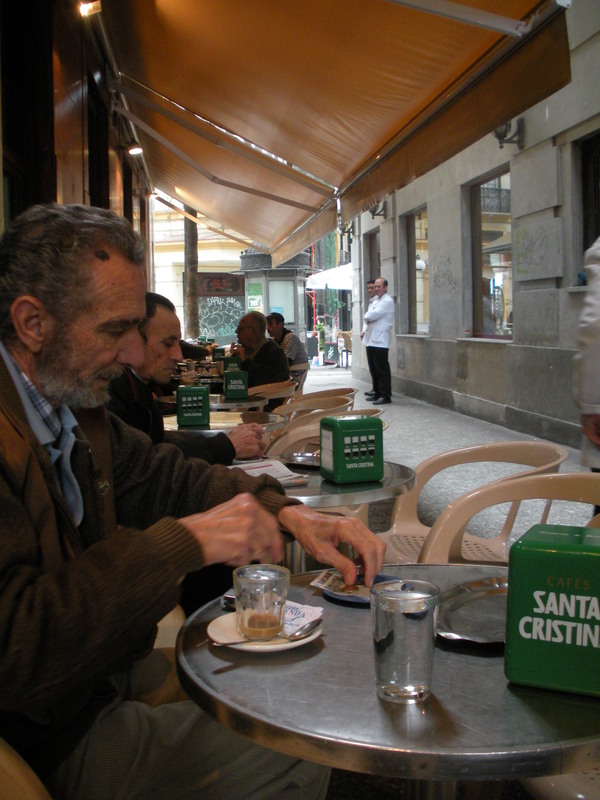 At left is Casa Aranda(Calle Herrería del Rey, 3), a great place for churros y chocolate and people watching. 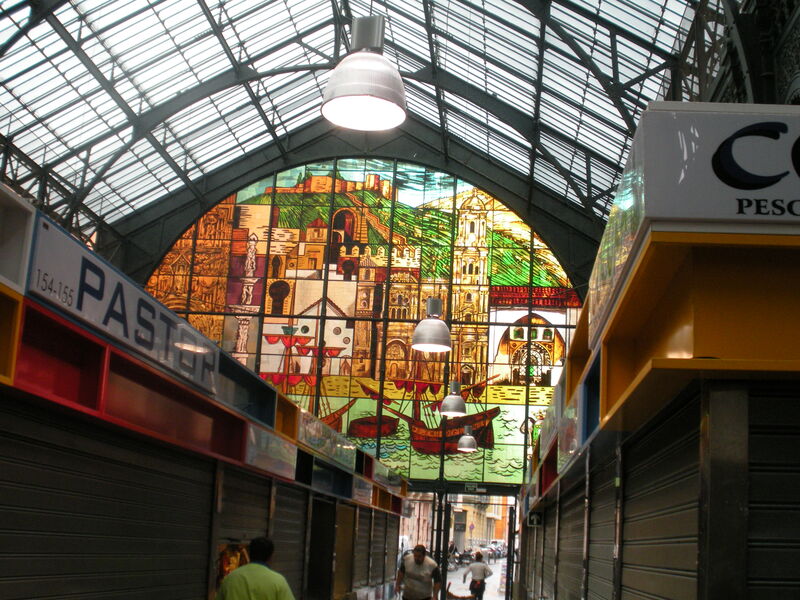 We didn’t manage to get to the Atarazanas market while it was open this trip, but I had to get a pic of the beautiful stained glass window which we missed seeing our first time in Málaga. Admittedly this is not the best pic but at least we saw the window! And I managed to snap it just as the market was shutting down for the day. The weather wasn’t fabulous like it was the previous May but it was fairly pleasant nonetheless. When we landed it was close to 70 and it was in the upper 60s the entire time with a little bit of rain for our day trip to Córdoba. 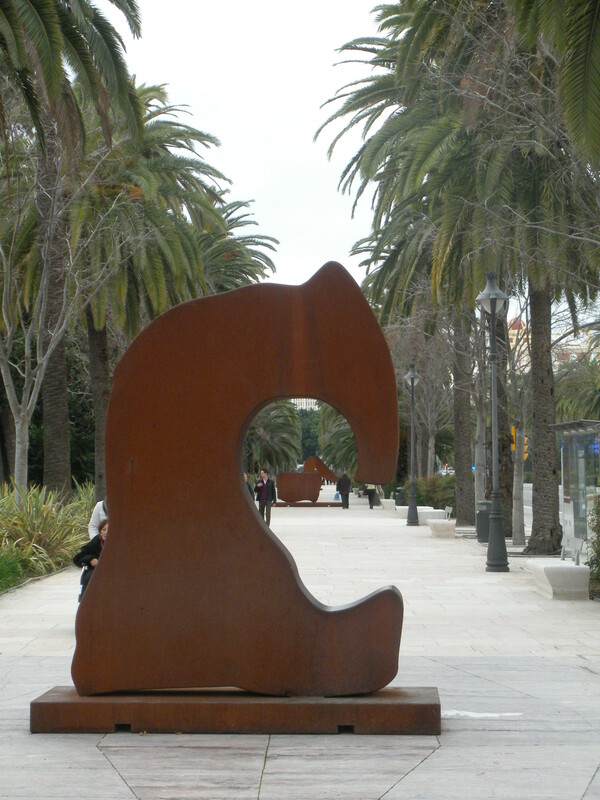 We walk everywhere when we’re in Málaga and we had a nice stroll along the Paseo del Parque where there are some interesting sculptures. 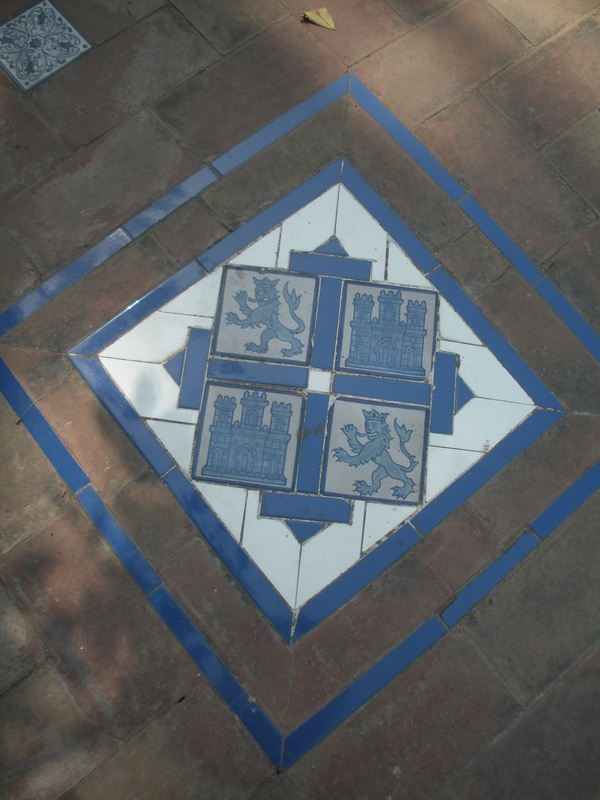 We saw some great tilework as well. 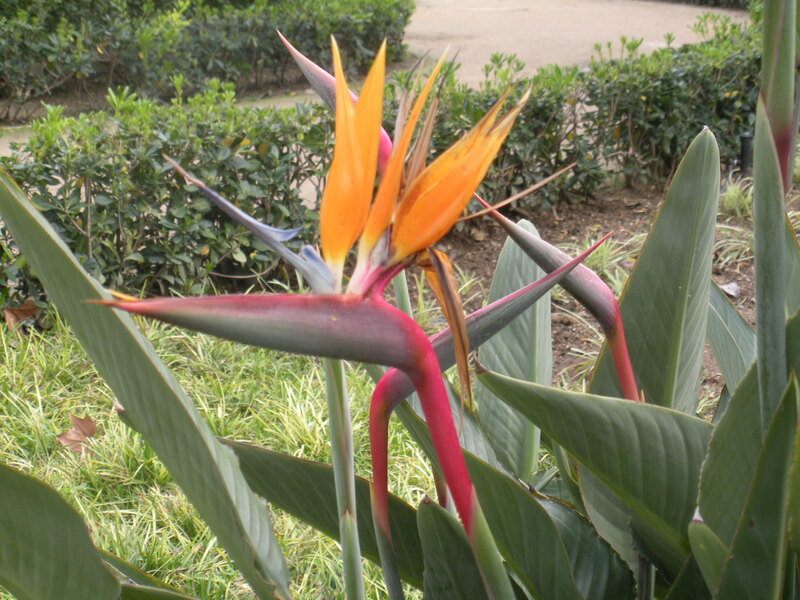 The bird of paradise reminds me of growing up in southern California. And, the orange trees were in bloom and oh! the aroma of orange blossoms also brought me back to my youth in California. Such a sweet, sweet aroma wafting through the air. Spring is a great time to visit southern Spain. 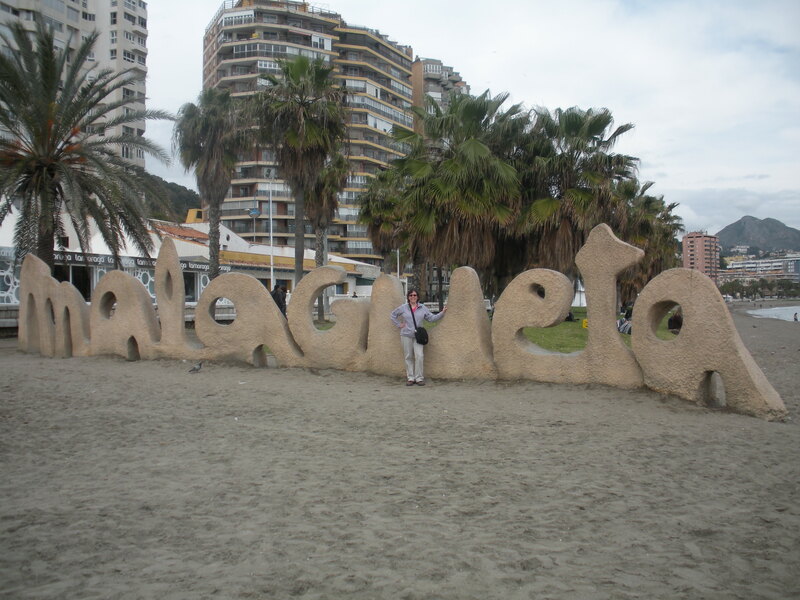 We walked all the way to Malagueta beach, we just had to put our hands/feet into the Mediterranean Sea! We also picked up several shells to bring back home. 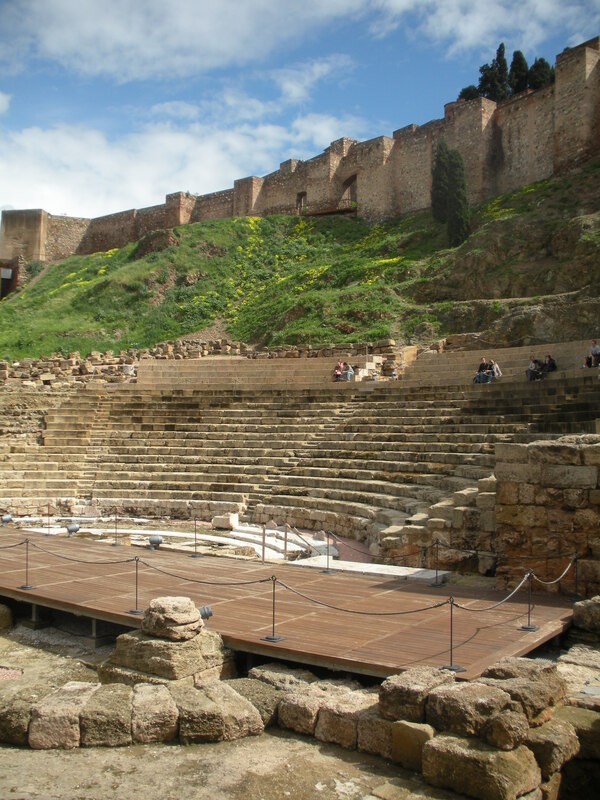 What visit to Málaga would be complete without at least viewing the Roman Theater and the Alcazaba behind it? 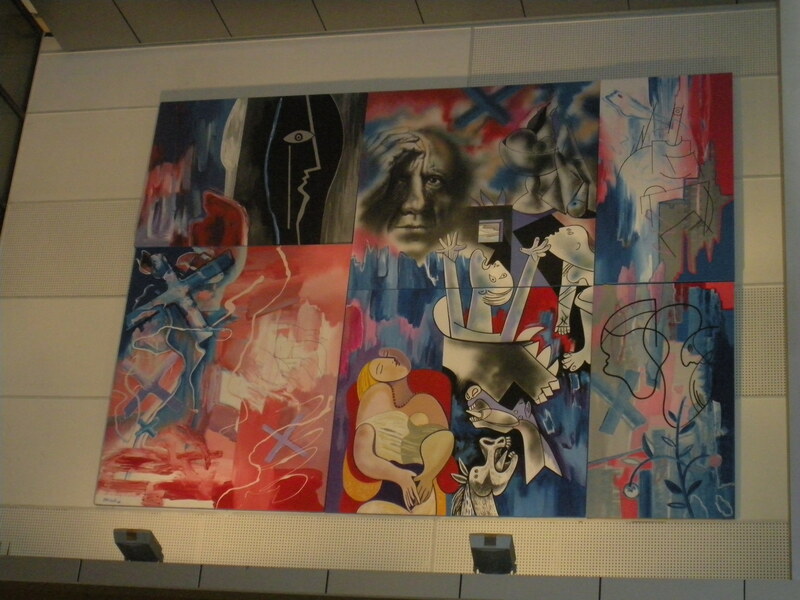 Well, none, so here are a couple of those pics. The Roman Theater dates to the 1st century. Wow……. 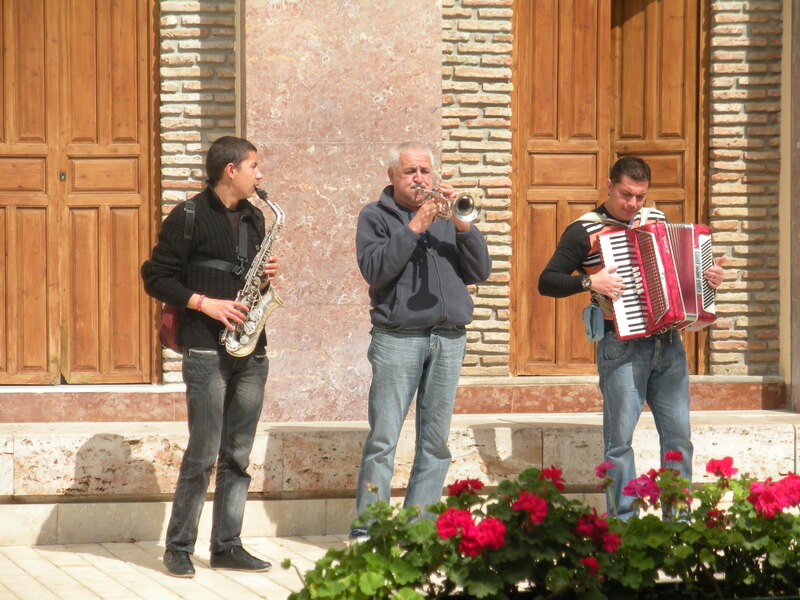 Wandering musicians regaled us with their tunes while we took refreshment at El Pimpi. 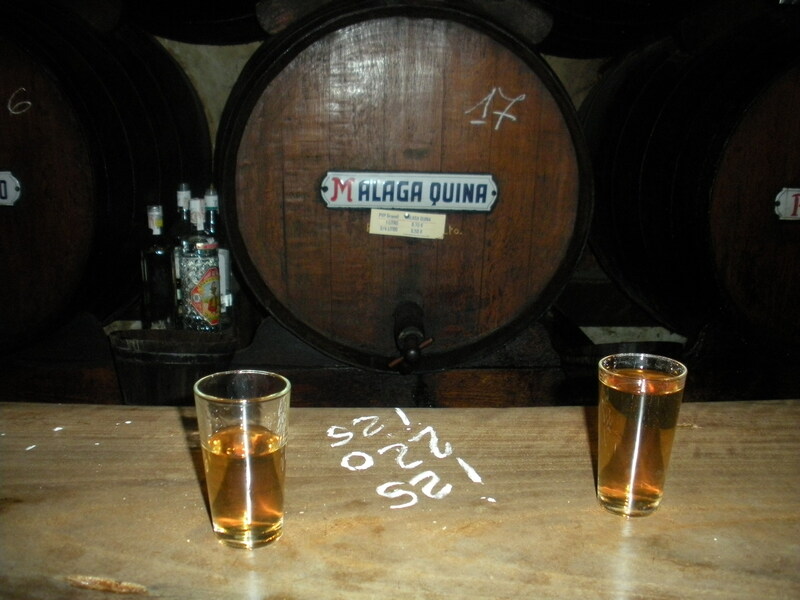 One place that I read more about after our first trip to Málaga was Antigua Casa de Guardia for Malagueñan sweet wine. We needed to check it out. And what did we find? 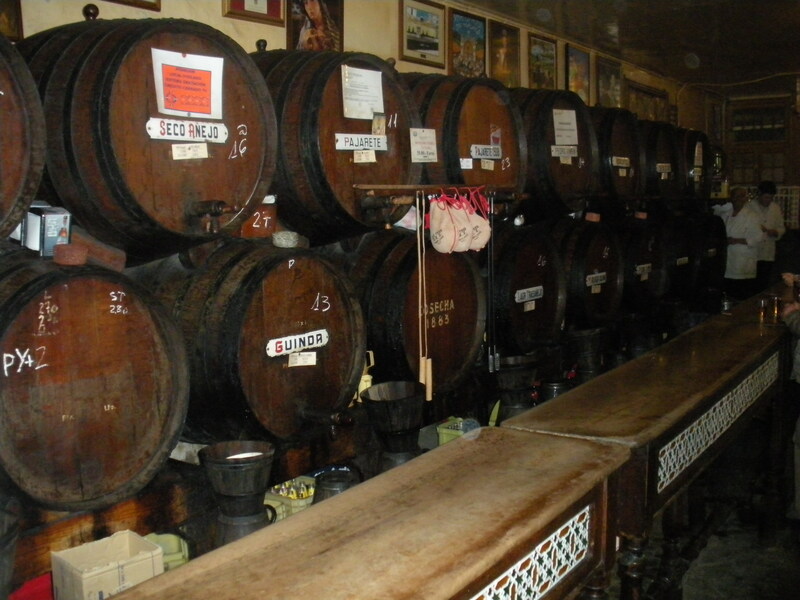 An old, stand-up type bar with many barrels against the wall, stacked 3 high. Wine is all that they serve too. I had jotted a couple of the names of wines that I wanted to try and confidently asked the waiter for the first one. Yummy!! Can I have some more please? The fun thing about this place is that it’s like the Spain that I lived in more than 30 years ago. Nothing is automated. Our bartender(right) kept track of our bill by writing the amounts of our wines in chalk on the counter in front of us. When the customer is done, he adds it up, the customer pays and then he wipes it clean so he can start again with a new customer. Yep, we stumbled out of that place! But we were very happy and full of sweet wine. 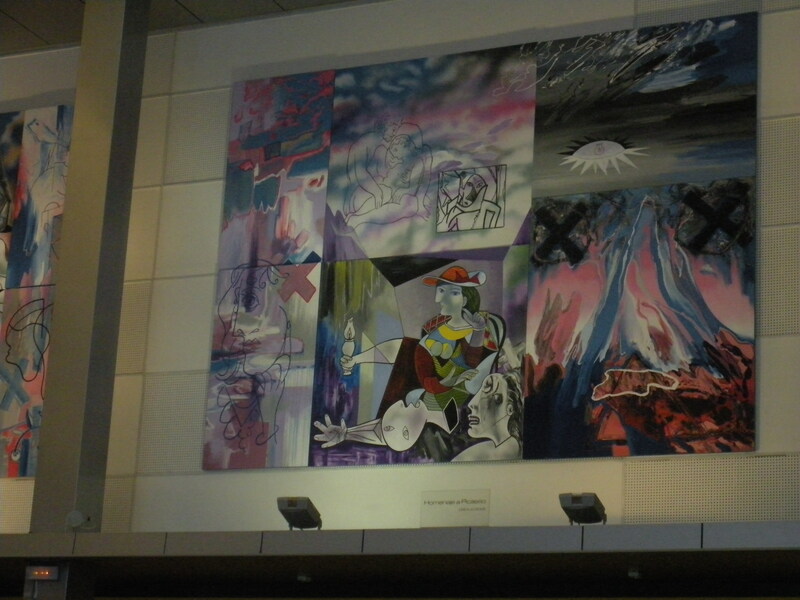 At the train station to catch our train to Madrid I saw some Picasso-esque paintings whilst waiting to go through security. 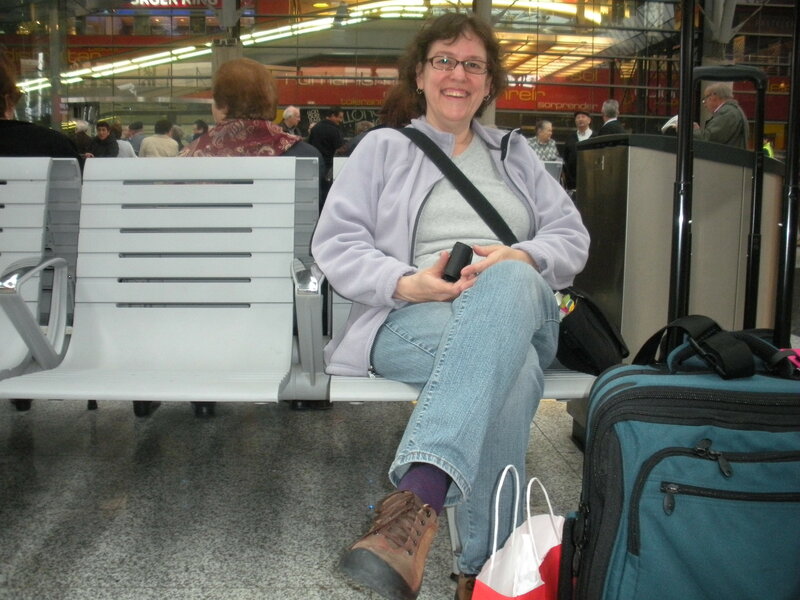 And, finally outside of the ticket taker booth waiting to board our AVE to Madrid. Train travel in Spain is just great and so much more improved than when I lived there! The fast trains then were the talgo trains. I recall a couple of overnight train rides, one between Madrid and Barcelona. It was about an 8 hour trip then and we took overnight trains to save on travel time. And did I marvel at the quick 2.5 hour trip on the AVE the previous May. I was in awe and continue to be. I can’t wait to travel by train again in Spain. Au revoir Málaga. Until we see each other again. I have to start this with a story from when I was a college student in Spain. I was part of the Cal State group that spent an entire academic year (most of us were juniors) in Madrid and Granada. A handful of the group were to study in Granada. One of our group trips was to the south of Spain to drop off the Granada students. 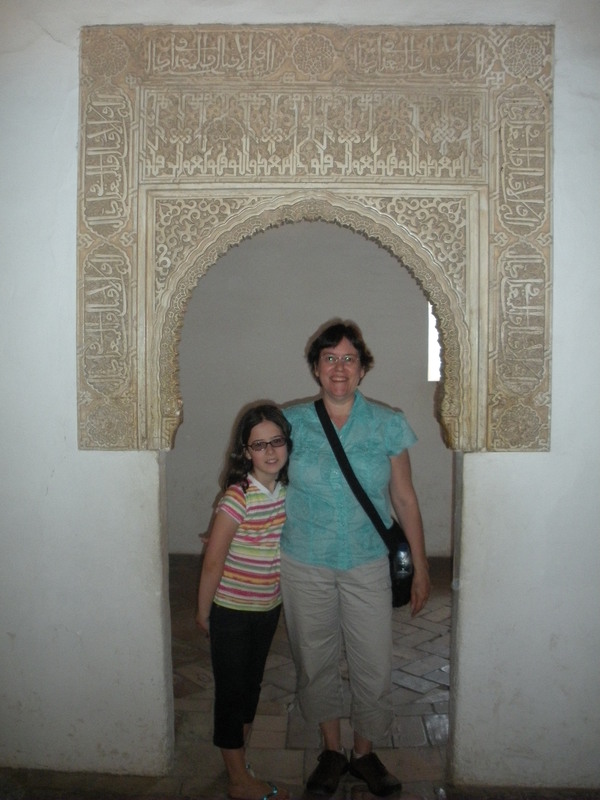 On our way we stopped to see the mezquita in Córdoba and my memory told me that we stayed the night in Sevilla. 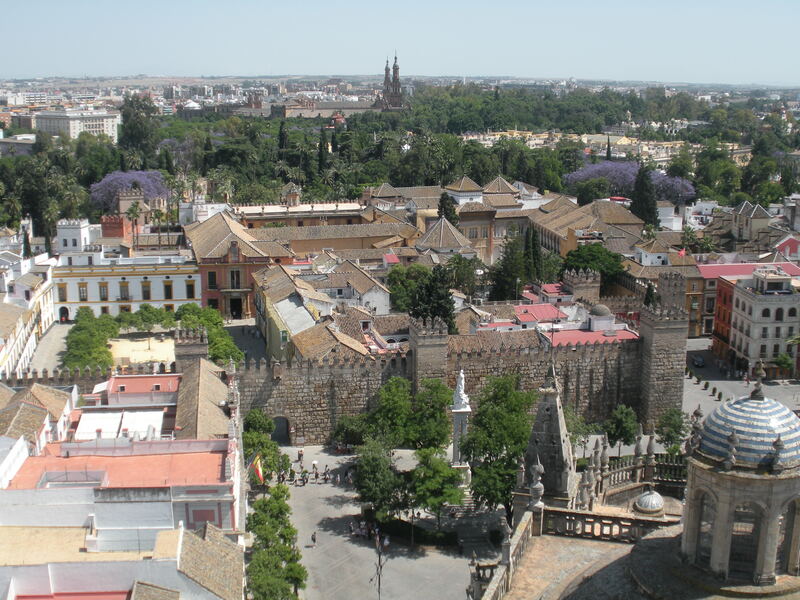 I remember going to the cathedral and Plaza de España but I couldn’t figure out why we didn’t go to the alcázar. 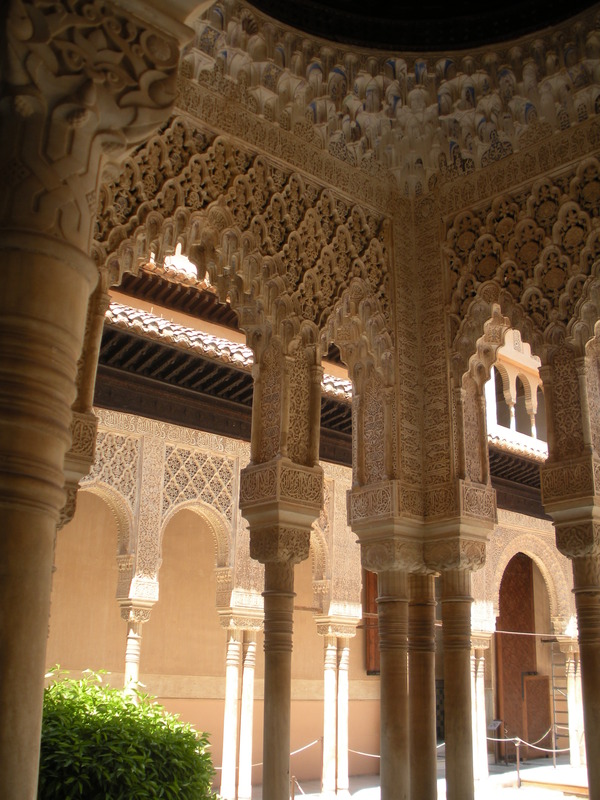 While doing the research for our trip in May 2010 I read about the alcázar and knew I had to see it. But it was buggin’ me why we didn’t go there all those years ago (it was 1980). 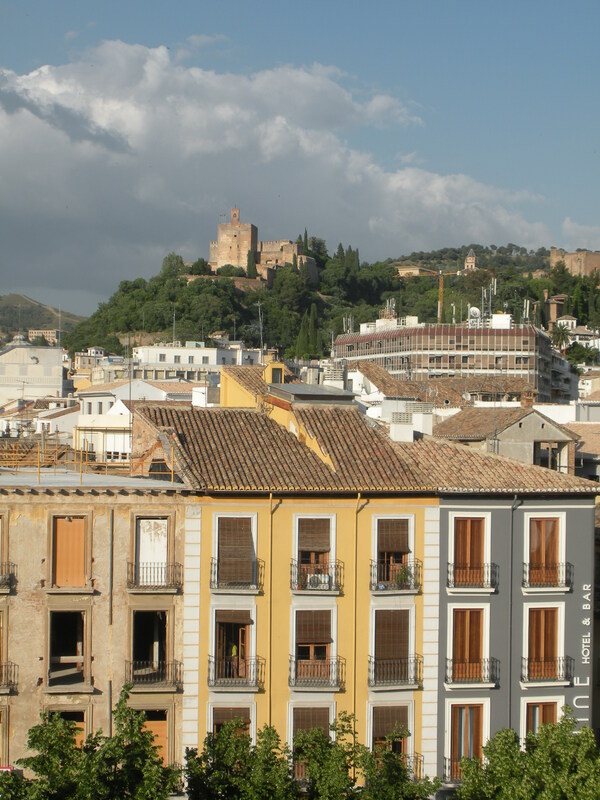 After we returned from our trip in May 2010 I was looking at the scrapbook I put together from my year in Madrid and I came upon a receipt for the place we stayed overnight in……in Granada!! All these years I had pictured that we stayed the night in Sevilla!! 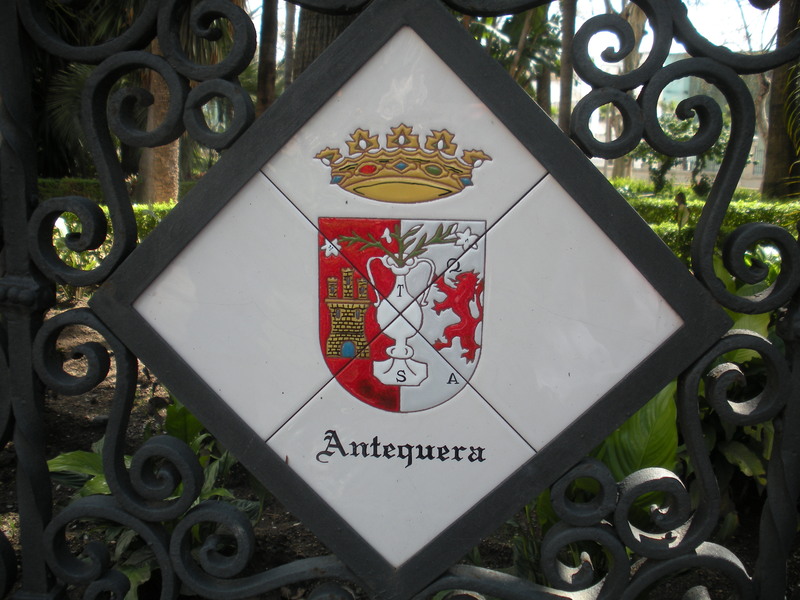 No wonder we didn’t go to the alcázar, we did not have time!! 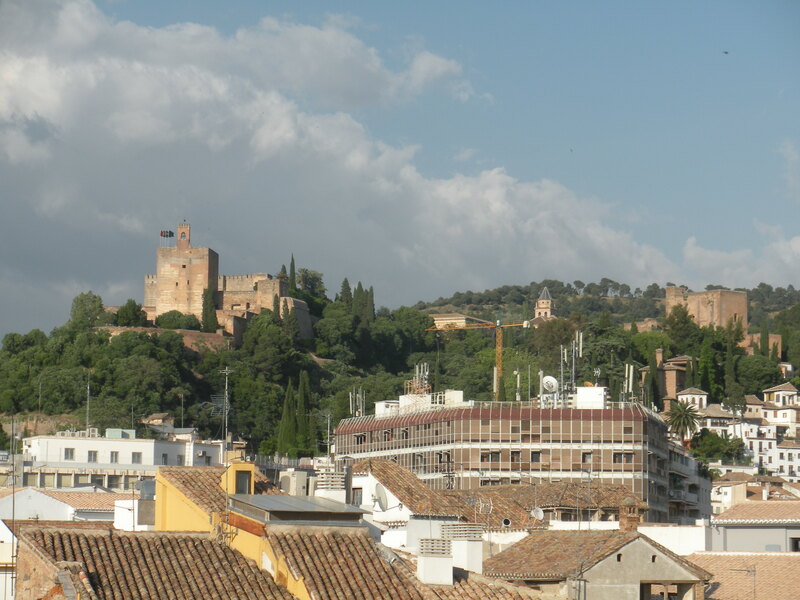 I think we saw the mezquita in the morning, then Sevilla’s cathedral and Plaza de España in the afternoon and then made our way to Granada, spending the night there then went all the way back to Madrid the next day after what must have been a short trip to the Alhambra. Whew! What a weekend that was! and I barely remember it. 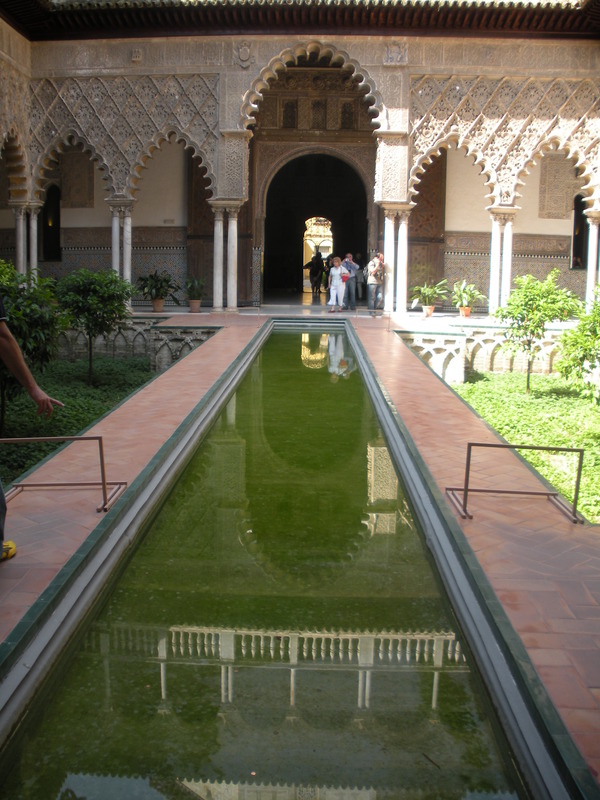 I absolutely loved the alcázar and was so glad we were able to see it on this trip. 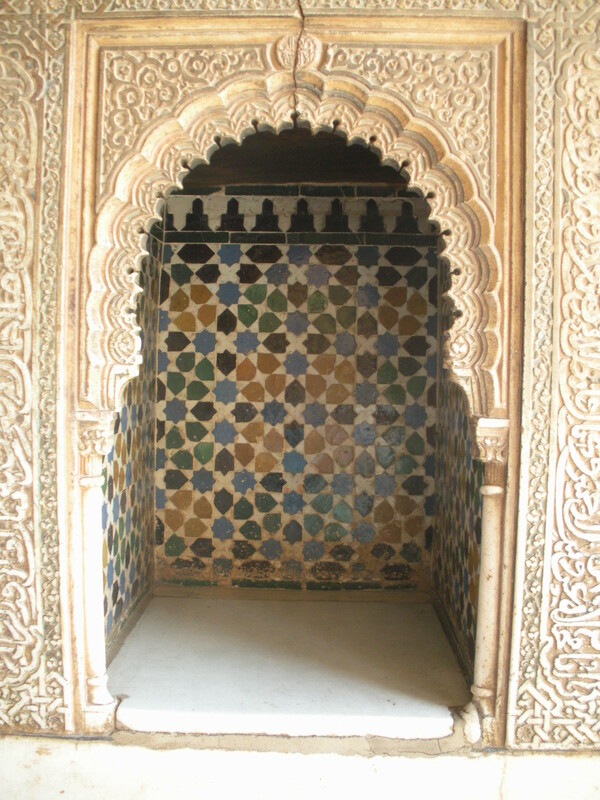 Without further ado, here are some of the highlights of our trip to the alcázar in Sevilla. 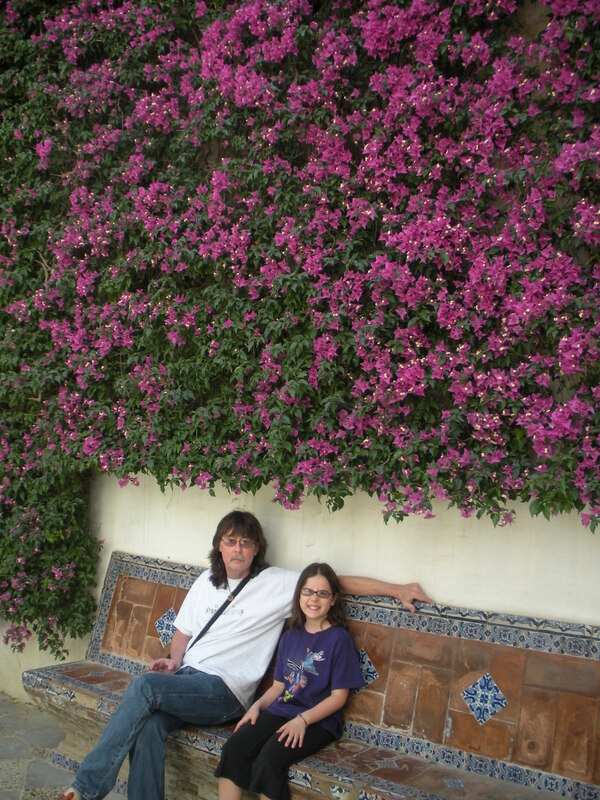 Did I mention the bougainvillea? 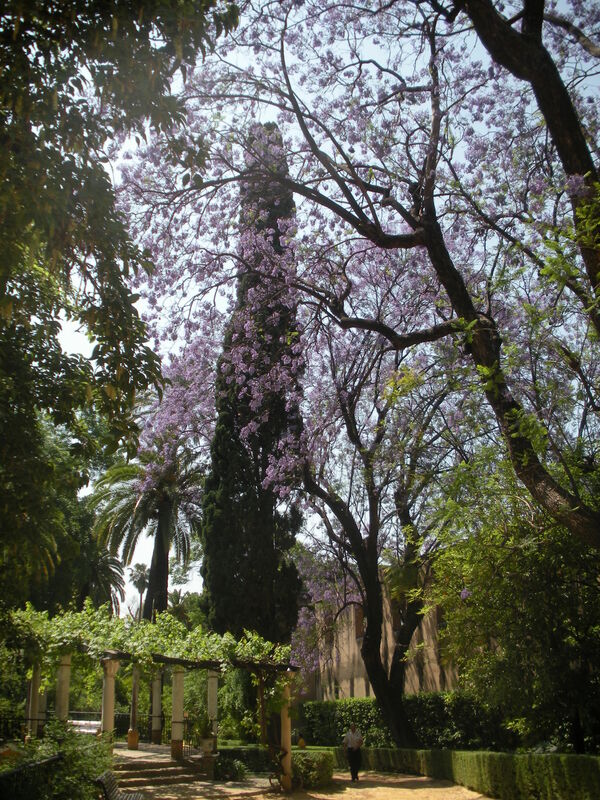 The jacaranda trees were blooming, alas, it was hard to capture their beauty. This was an attempt.